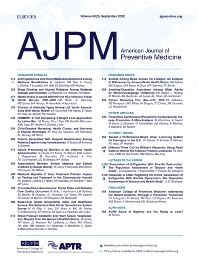 The American Journal of Preventive Medicine is the official journal of the American College of Preventive Medicine and the Association for Prevention Teaching and Research. It publishes articles in the areas of prevention research, teaching, practice and policy. Original research is published on interventions aimed at the prevention of chronic and acute disease and the promotion of individual and community health. Of particular emphasis are papers that address the primary and secondary prevention of important clinical, behavioral and public health issues such as injury and violence, infectious disease, women's health, smoking, sedentary behaviors and physical activity, nutrition, diabetes, obesity, and alcohol and drug abuse. Papers also address educational initiatives aimed at improving the ability of health professionals to provide effective clinical prevention and public health services. Papers on health services research pertinent to prevention and public health are also published. The journal also publishes official policy statements from the two co-sponsoring organizations, review articles, media reviews, and editorials. Finally, the journal periodically publishes supplements and special theme issues devoted to areas of current interest to the prevention community.